The Impco model J regulator/vaporizer delivers reliable performance and pressure output consistency. Its reliability, especially with questionable fuel quality, has made it an industry standard for many years. Two vapor outlet pressures are available. The standard Impco model JB (this version) provides -1.5"wc (0.37 kPa). The optional JO (J-orange) provides 0.5" wc (0.12 wPa) . 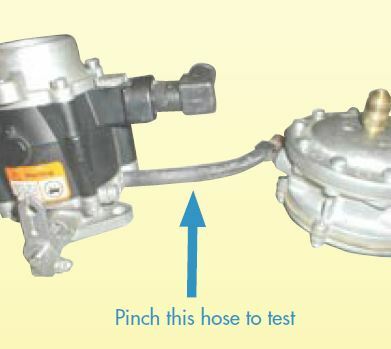 The port size and mounting pad locations are identical to the Impco Cobra regulator and include a primary pressure test port and "left" or "right" fuel outlets. Find the Impco COBRA regulator here. Use a needle-nose pliers to pinch the vacuum hose on the VFF-30. If the RPM speed changes, the o-ring seal is bad. If after disconnecting the hose the engine doesn't die or the o-ring is bad, the Impco VFF-30 needs to be replaced or rebuilt. You can also test this using carbon monoxide readings. *If you have an electric lockoff in your lift truck, you will also have a vacuum safety or an oil pressure switch. It is against regulations for these to be disconnected (see NFPA Pamphlet 58). Push the primer button while the engine is running on the Model J vaporizer-regulator. IMPCO no longer manufacturers a model J with a primer button. However, primer buttons are available on Impco model J generic units which we offer. The engine should stall or completely shut off while pushing the button and start back up to idle as soon as you release. If this doesn't happen or pushing the button causes the engine to speed up, adjustments are needed with the air-fuel mixture in the mixer. To watch how a Impco model J is rebuilt, check out this video here. A video on how to rebuild an Impco VFF30 can be found here. Turn the idle mixture screw (on the mixer) counterclockwise as far as possible. The emissions reading should decrease in carbon monoxide. Take out the air filter and inspect it. Replace the filter if there is an increase or decrease in emissions after the air filter is removed. If you haven't had any problems with anything in steps 1-4 and CO levels are still too high, the mixer must be replaced. 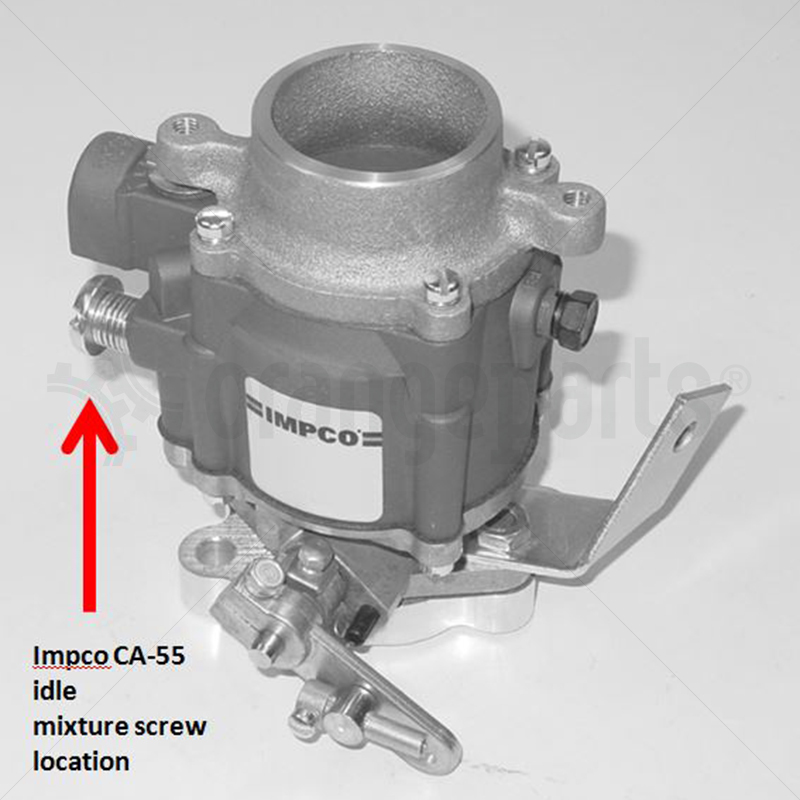 Usually, you can replace your Impco Model 50 carburetor/mixer with a new Impco Model 100 or 125 with minimal adaptations. If this is not the case for you, go with a Model 55. 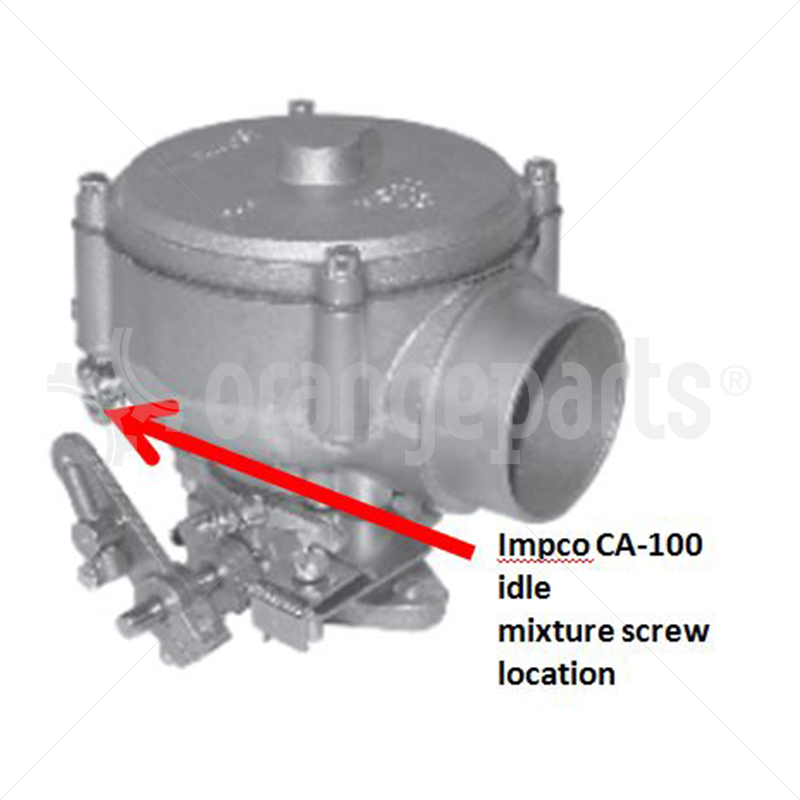 There are 4 screws holding the Impco Model CA100/125 mixer cover that need to be removed in order to check out the air valve. (It should be part AV1-14-4; if not, replace with the correct part.) Make sure the metering cone is clean on the inside and there are no signs of wear. If you see marks implying the valve is rubbing, either sand the guide gently or replace the air valve. A lean air shim or 2 may be installed at this point if the fuel mixture still isn't right. Install the first shim on the metering cone lip and check the emission levels; if only a minor improvement, add the second shim. *Clean the air valve with a solvent solution. Do not wash the diaphragm or use an abrasive cleaner on any parts. Make sure the gas valve cone is tight in the body housing. 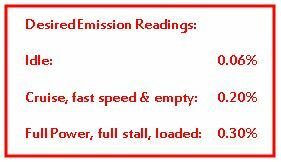 Emissions should be at an acceptable level when the truck is idling. Set the power mixture and load the mast by tilting completely back or forward. If you have a rich condition based on the exhaust analyzer, turn the power valve, or gate valve as its also known, to the "L" position. Model JB - The B stands for blue spring. This is by far the most common model J regulator. The blue spring offers negative 0.37 kPa (1.5 inches w.c.) The Impco model JB diaphragm is made of hydrin and is suitable for most applications. Model JB-2 - Is similiar to the JB--only difference is that the diaphragm is made of silicone and is suitable for cold climates. We offer a generic model JB which has a primer button. Some old models of forklifts still have a primer button on the LP regulator and we're one of the few online that offer this version. You can repair and rebuild model J regulators using repair kits made of hydrin or silicone. There's no limit to how many times you can rebuild a model J regulator. Impco developed the next version of regulator after the model J and called it the model K. Impco but quickly changed the name to COBRA after learning that the US trademark office would not trademark an alphabetic letter. The COBRA will work perfectly in place of a model J. COBRA will work for a model J application but model J should not be used for a COBRA application. We offer COBRA repair kits and yes you can rebuild COBRA units as many times as you wish. COMMON QUESTION: My forklift came with a model JO. Can I use a model JB or JB-2? Yes--as long as you understand the difference between hydrin and silicone there's no problem.